Description: 41T is ready to go as it sits next to the rubble from the set out tracks that once adjoined the DLW station. The NRHS equipment was moved at the time the new ballpark was built, and some of the debris still remains a dozen years later. Description: 41T gets its all black consist underway across the Chenango River on a gloomy afternoon. The conditions will improve markedly by the time the train reaches Owego. At this time, it was common to see IC units on this train, mostly SD 40's, but occasionally SD 70's would show. I think I've seen more IC power on the Southern Tier than on the IC itself. Description: Or in this case, cutting down the corn stalks. The heavy overcast at Binghamton has yielded to bright sun at Miller Beach Rd, as 41T rolls its 62 cars west past a grain wagon that carries the colors of a now vanquished granger road. Description: 12T crosses the Chenango River on a typically bright Binghamton day. Power is even dark, and not the usual CN units, though the trailing unit is a surprise for anyone expecting a solid set of NS black. Description: NS #236 rounds a curve near CP Reed with a hot intermodal and a CSX helper. Description: NS work train 95A has been used by track crews during recent maintenance. It has been tying up in Opelika every night. Description: Slight review of the train these 2 were hauling. West Park is a family-friendly area, with nearby playgrounds for children. This location is also railfan friendly. 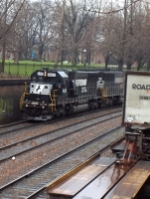 Description: My camera's shutter speed lagged a bit trying to capture the departure of this train. Description: Westbound on track two with three GEs and an EMD. Description: 158 departs Linwood on a rainy morning with an SD60 up front. Description: Eastbound on track one passing through the brickyard crossing. Description: Shot this evening mixed freight out of the window of my car because I was simply too lazy to get out of the car. Title: A touch of blue in a sea of black. Description: 18M's power backs up at Valley.